It seems that many food manufacturers have resorted to using trickery to give consumers the impression that their brands are healthy. I cannot stress how important it is to READ the labels. 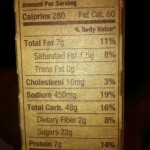 It is very important to read the ingredients AND the nutrition facts. Many food manufacturers have resorted to using “healthy looking” packaging as well as tricky terms like “no sugar added” or “whole wheat” to fool consumers into believing that an item is healthy. On a recent trip to the grocery store I had to pause, and gather photographic evidence of this trickery at its finest. 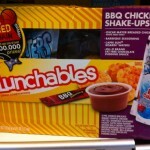 Lunchables are an item my kids constantly harass me to buy for them, and I always decline calling them “junkables”. Well, Armour has presented a very pretty package that they refer to as Active Packs. So when I saw what “appeared” to be a healthy version, I HAD to check it out. I present to you, Oscar Mayer Lunchables versus Armour Active Packs. 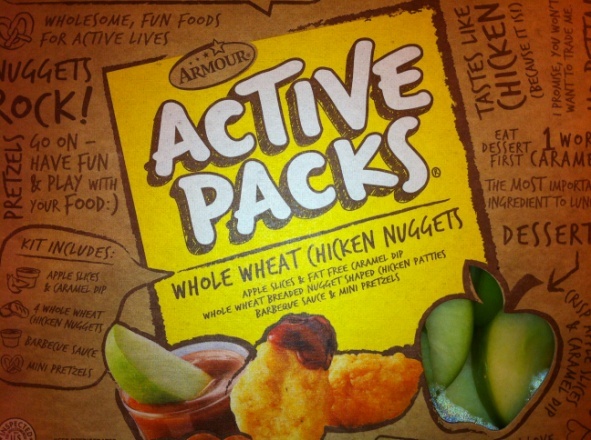 On the cover, Armour Active Packs boasts whole wheat chicken nuggets, apple slices with caramel dip, & pretzels. 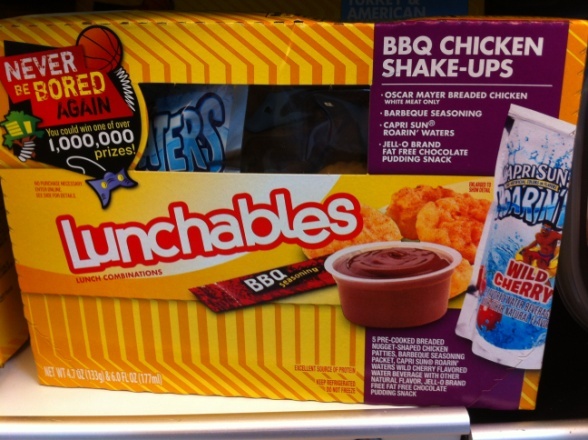 Meanwhile Oscar Mayer Lunchables version offers “white meat chicken”, a Capri sun, & fat free Jell-O brand chocolate pudding. 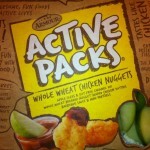 I noticed that Armour did not mention anything about the chicken in these whole wheat chicken nuggets. 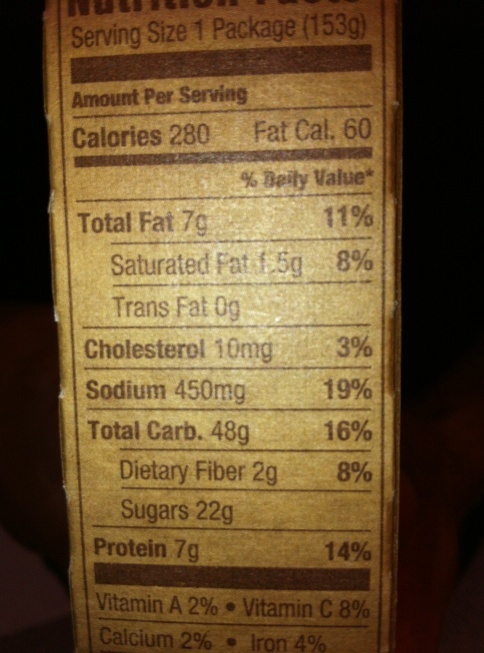 Upon further investigation I found that these nuggets were a mixture of Chicken Breast with Rib Meat, Water, Modified Food Starch, Contains 2% Or Less of Natural Flavorings, Salt, Rice Starch, & Chicken Flavor (Chicken Skins, Chicken Broth, Salt, Flavor, Polysorbate 60, Xanthan Gum, Disodium Inosinate & Guanylate). Yummmm…..nuggets anybody? So what’s the good news here? I DID discover that these chicken concoctions are at least breaded in whole wheat flour. You see, the term “wheat flour” also means “white flour”, but when you see the term “whole wheat flour”, that’s when you’re getting the whole grain wheat flour. At least they are made with whole wheat flour, right? So let’s look at these labels side by side. While I wouldn’t recommend either one of these as a healthy choice for someone, let alone our children, it appears that Oscar Mayer Lunchables actually have more protein, less sugar, less calories, and less fat than Armour’s Active Pack. It’s shocking to think that many people will see the words active pack, whole wheat, and apple slices and automatically assume they are making a healthy choice. Don’t be fooled by pretty packages and trick words. Read labels carefully before putting something in your body. 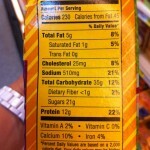 You will be amazed at how many foods have hidden trans fats, sugars, artificial flavorings, and are loaded with sodium. Many foods turn out to be anything BUT healthy. LIGHT – this is super tricky & has several meanings: a product has fewer calories or half the fat of the non-light version; the sodium content of a low-calorie, low fat food is 50% less than the non-light version; a food is clearer in color. SUGAR-FREE or NO ADDED SUGAR – this doesn’t tell you anything about sugar substitutes or sugar derivatives which can have just as many calories as regular sugar! Pay attention to the ingredients in products as well. 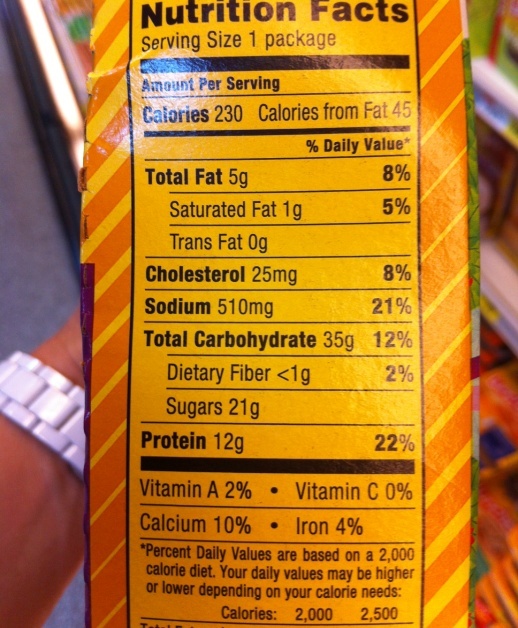 The ingredients list is where you find hidden fats, sodium, sugar, and artificial flavors. Keep in mind that the first ingredient will usually be the largest in quantity, as the second ingredient will be the second most, and so on and so forth. A rule of thumb I like to follow is if an item is packed with ingredients that I can’t pronounce, leave it on the shelf. Sticking with products made from whole foods, and that have little to no preservatives is always a healthier choice.